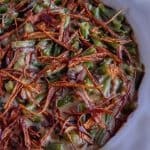 Green bean casserole, another Thanksgiving staple. 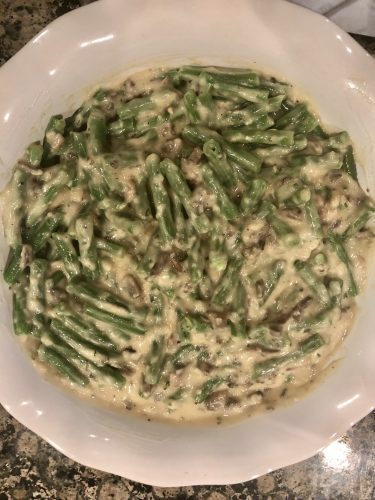 I was never really a fan of green bean casseroles… I love mushrooms and green beans, but the typical canned route always turned me off. I know it’s easy and quick to resort to canned foods and there isn’t always a problem using them, but with this recipe fresh ingredients really pay off. First comes the green beans. I actually love snapping green beans, I def posted up in front of the TV watching Netflix and snapping away at the ends (#NetflixandSnap?). After prepping the green beans I always blanch them, if you put the raw green beans into the casserole they aren’t going to be able to cook through. Blanching is kind of like flash cooking, you put the green beans into boiling water for a few minutes and then you stick them into an ice bath to prevent them from cooking more. 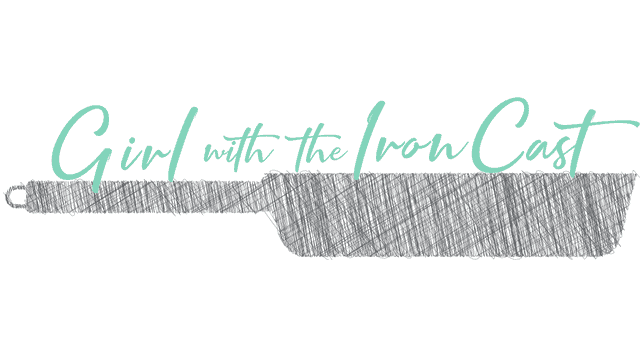 This is how you achieve that bright green color and tender texture. Next comes the mushrooms. Using fresh mushrooms really elevates the dish on top of the fresh green beans. I actually don’t typically cook with that much butter, but its Thanksgiving so you’re supposed to indulge right? 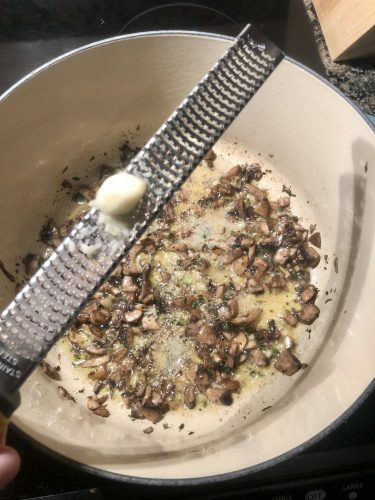 Sautéing the mushrooms with the fresh herbs and grated garlic not only gives you so much flavor, but the aromatics tell you this is going to be delicious. If you haven’t grated garlic before, it’s a great way to infuse garlic flavor into dishes. Now lets make the best part, the sauce! Making sauce from scratch is actually easier than you think. Flour along with broth is how we thicken to get that creamy consistency and where all the flavor is going to come from in this dish. You may think its weird seeing soy sauce and lemon juice in this recipe, but trust me it gives it so much flavor. Once the sauce is made we are going to pour it over those bright blanched green beans we made in the beginning. You’re going to put this in the oven so all the flavors meld together while we prepare the garnish, fried shallots. Typically you buy canned fried onions and throw them on top of your casserole, but again this homemade touch makes a huge difference. You can hand slice the shallots or personally I used a mandoline (SAFELY! ), just make sure they are thinly sliced. In a small dutch oven or pot that can handle high heat, heat canola oil over high heat (mine was on 8). Add the shallots, they will cook first then start to fry and become golden brown. This process depends on how big your pot is and how many shallots you put in at once. Mine took about 10-15 minutes and I kept stirring every few minutes. I did burn my first batch because I wasn’t paying attention, once they are golden brown remove and place on top of a plate lined with paper towels to drain the excess oil. 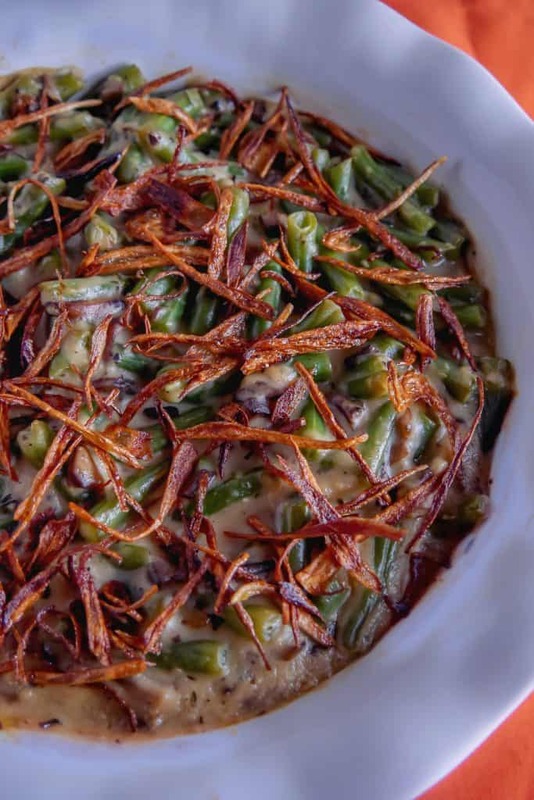 Once the green bean casserole is hot and bubbly, remove and then garnish with your fried shallots! 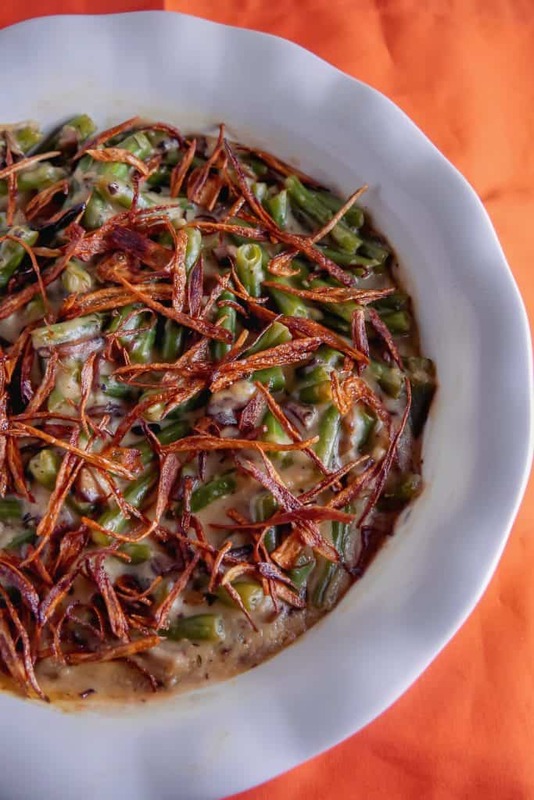 Trust me throw out the cans, this green bean casserole is a total game changer. 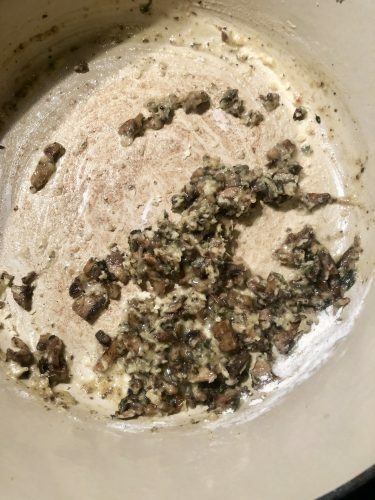 Things you’ll need: Pot to boil green beans, medium bowl for ice bath, large skillet to sauté mushrooms & make sauce, small dutch oven or fry safe pot, plate lined with paper towel, baking dish for casserole. Green bean casserole made from scratch with fried shallots on top. Prep the green beans, trim the ends and cut into 2 inch pieces. In a boiling pot of water, add green beans and cook till bright green about 4-5 minutes. 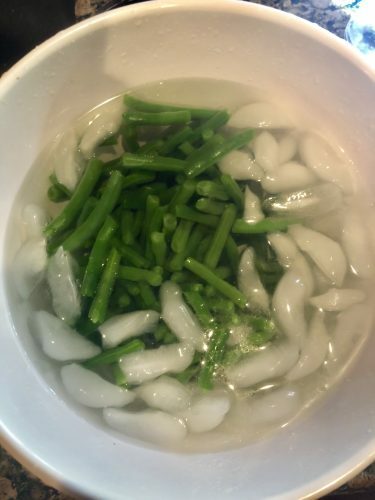 While green beans are cooking, get a large bowl and add ice and water. Once green beans are done blanching, immediately drain and transfer to ice bath to stop the cooking. In a medium bowl, whisk together soy sauce, lemon juice, stock, cream, and set aside. In a dutch oven or large sauté pan over medium/high heat, add the butter. 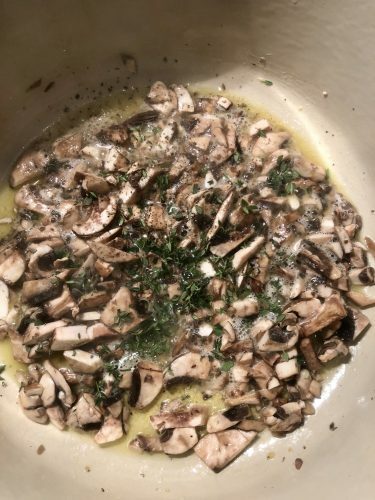 Once the butter is melted add the mushrooms and sage/thyme, cook for 6-8 min until the mushrooms are sizzling. Grate the garlic and cook for about a minute. 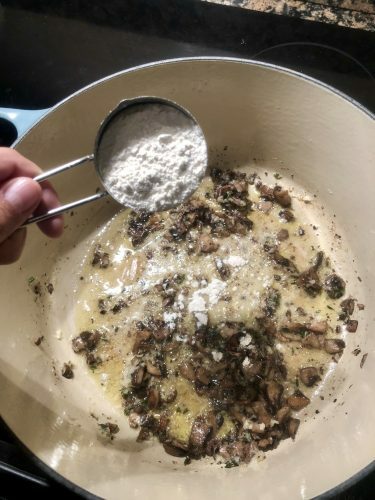 Add the flour and cook for 1-2min stirring constantly until absorbed into the mushrooms. 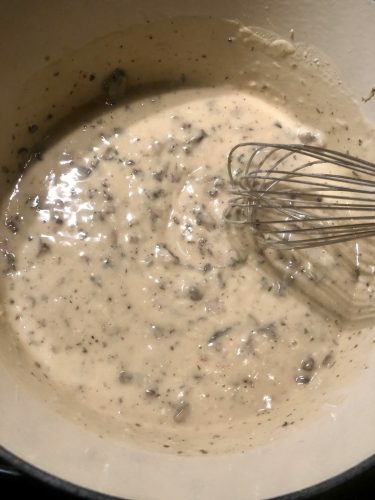 Whisking constantly, slowly add the broth/cream mixture to the mushrooms and bring to a boil. Once boiling, reduce to a simmer until sauce thickens about 5 minutes. Season to taste with salt & pepper. 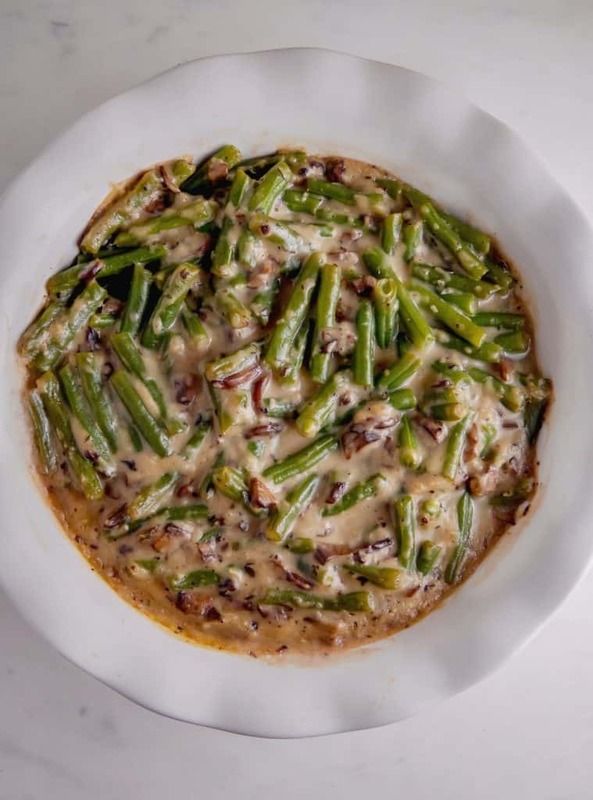 Add green beans to greased baking dish and pour mushroom sauce over the top. Stir gently to combine and put in the oven to bake for 15-20 minutes. While the casserole is in the oven, time to fry the shallots. In a small dutch oven or fry safe pot, add 2 cups of canola oil and heat over high (an 8 on my range). Once heated up, add shallots and stir frequently until the shallots are crisp and golden brown about 10-15 minutes. Transfer to a plate, lined with multiple paper towels to drain excess oil. Season with salt and let cool. Remove casserole from oven, top with fried shallots, and serve.